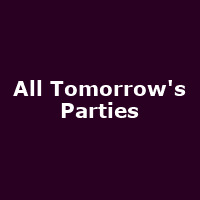 The sixth instalment of All Tomorrow's Parties music festival's A Nightmare Before Christmas, has been announced. This year's curators are none other than Dublin indie kings, My Bloody Valentine, who have let slip some of the line-up to come, which includes previous curators Sonic Youth, connoisseur hip hopsters De La Soul and EPMD, free jazz deities the Sun Ra Arkestra and Goth revivalists The Horrors, among other acts to be confirmed. A Nightmare Before Christmas'09 will run from December 4th to 6th and take place in Minehead, Somerset, as the third series of this year's ATP program, with Weekend One (May 8th-10th) and Weekend Two (May 15th-17th) taking place this month, and which, will between themselves, host performances by Devo, Spiritualized, Killing Joke, Beirut, Lydia Lunch, The Breeders, Kymia Dawson, CSS and Tricky, among others. Tickets for A Nightmare Before Christmas'09 are on sale now and range from £318.00 to £1176.00 (+ booking fee), depending on accommodation package. Thu 11th Jul 2019 The Summer Series, The InternetSomerset House (Westminster)More Info.. Sat 27th Jul 2019 Leopallooza, The VaccinesThe Wyldes (Bude)More Info..
Sun 28th Jul 2019 LeopalloozaThe Wyldes (Bude)More Info..